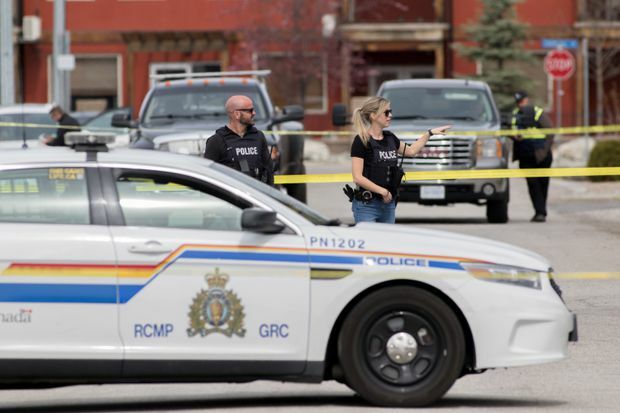 RCMP officers continue to work outside a crime scene at the corner of Lakeview Drive and Heales Ave. in Penticton, B.C., on April 16, 2019. Family and friends are remembering neighbours who were gunned down in Penticton as the small city in British Columbia’s south Okanagan held a vigil Wednesday for the four victims. “Rudi wouldn’t hurt a fly. He’s the most calm, peaceful guy you’d ever meet. If there was a confrontation, he wouldn’t address it,” he said, adding that Winter “pretty much” raised him. John Brittain, 68, a former employee in the city’s engineering department, is charged with three counts of first-degree murder and one count of second-degree murder. None of the allegations against him has been tested in court. “They were probably the best neighbours we ever had,” said Murphy, adding he knew Barry for 14 years. “They were both the nicest people you could ever, ever ask to be with. When we went over, they really made you feel like somebody,” he said. “Any store I walk into – restaurants, coffee shops – people are talking about it. It’s affected everyone,” she said. Matthew Baran, executive director of the Ooknakane Friendship Centre in Penticton, said it’s not uncommon for the community to rally behind others in times of tragedy. “It’s a very caring community organically, that’s just normal,” he said. “We’re a strong community and this is part of the process of how we will rise up from this,” he said. Members of the crowd raised candles in the air and embraced one another as some of the community’s leaders gave brief addresses. Some said came to show support for the children of the victims. Gina Hansinger went to high school with one of the victim’s sons, while Bernie Burger said he works with Winter’s daughter. “As a friend I was glad to see her, to show my support,” he said. Carleen and Gordon Dyck said they came to give the family support even though they didn’t know them. “We’re just devastated at the idea of what can happen in a beautiful town like Penticton and realize how much stress and anxiety there is in the world today,” she said. “I think everyone’s feeling the same way, shocked, just senseless,” she said.